If you’re deep into your family history research and have not yet been able to find some of your female ancestors, you’re not alone. There are actually good reasons as to why you and many others can’t seem to locate these elusive ladies from your familial past. For one, if you’re looking for journals, letters, or important documents written by your female ancestors who lived as early American settlers, you could be wasting your time. This is due to the fact that most women were illiterate during that time period and written communications were mostly created by men. Secondly, federal census records dated before 1850 were only required to list the male heads of household. Even if a married woman owned property before she decided to get hitched, it was turned over to her husband — as well as the rest of her rights. This means seeking maiden names in census records prior to 1850 will likely be unsuccessful, as well. Of course, there are some exceptions to these rules. For example, you might have an ancestor who was widowed. Her maiden name could then be listed as the head of household. Unfortunately, after her husband died, she may have simply been recorded as “Widow” with her deceased husband’s surname listed after — not her maiden name. The good news is that there are some time-saving research tactics to uncovering the maiden names of your ancestors that can help you finally discover a new branch on your family tree — and some new surnames! Plus, if you get stuck, remember Genealogists.com has over 1,200 researchers ready to assist with whatever help you might need. The smartest way to begin your search for an ancestor’s maiden name is by scouring marriage records. This may be your only way to find an ancestor’s maiden name, so it’s important to start your research here. Don’t go into your research blindly! In order to find marriage records including certificates, contracts, returns, and registers, you must know the groom’s full name, the bride’s first name, the (approximate) date they were married, and the state or county in which they were wed. From there, you can sift through free online indexes, and head to family history libraries. Keep in mind that these documents can also be found at your local library, funeral homes, old churches, and elsewhere. Tip: Never overlook the names of witnesses in records, who could be on the bride’s side of the family. At times, death records can be a bust for finding maiden names — especially when a deceased relative’s parents aren’t listed on the death certificate, or the witnesses aren’t related to the family. Alternatively, looking through obituaries can help uncover some pertinent information on your female ancestors. The power of the internet has made it easier to find obituaries. Obituaries.com, Ancestry.com, and Legacy.com are all great places to start. In addition to searching the names of your ancestor’s parents, obituaries can list siblings names which may also suggest maiden names. Tip: Look at obituaries of your female ancestor’s children or husband, as well. This tactic could also uncover a maiden name you’ve been searching for. Did your ancestor or her spouse serve in the military? Then definitely search through military records, paying close attention to Veteran’s Benefit Records which could show her maiden name. You can obtain all sorts of military records by contacting the National Archives online, by mail or fax. To find an ancestor’s maiden name using military pension records, you must know the veteran’s name, the branch and state in which he/she served and began their service, plus the war in which your veteran ancestor fought. More information on obtaining military records can be found on Genealogists.com. 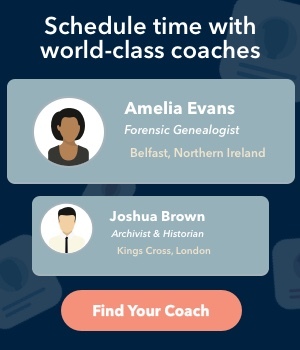 Tip: Unsure about the branch or time period in which your veteran ancestor served? Look to old photos for help. If your ancestor is in uniform, it could provide you with some clues. This research tactic can often be overlooked when it comes to finding ancestors’ maiden names. But if you’re already researching historic newspapers to find family stories, be sure to add a maiden name search to the list. You can uncover them by looking for wedding announcements and obituaries along with photos of the individuals in question. Use online newspaper directories to find owners of historic newspapers from the times and places in which weddings occurred or obituaries were published. If you find a newspaper you need, simply request to search a copy of the newspaper (see the list of resources below). In order to make this type of maiden name search go smoothly, you must know the approximate date of your ancestor’s death, and the full name of the deceased if searching obituaries. If you’re looking through wedding announcements, you must know the date in which your ancestor married and the name of the groom. Ayer Directory of Newspapers and Periodicals – You can typically find this resource at your local library. Library of Congress U.S. Newspaper Directory – Search newspapers dating back to 1690 and up to present day. The Online Computer Library Center (OCLC) – Contains a database of U.S. Newspaper Program National Union Lists. Can be found at most university libraries and some local libraries. It seems like a no-brainer that you should ask your family members about female ancestors. But sometimes, we get so deep into our family history and genealogy research that we can forget this important step. Even your younger, living cousins, uncles or aunts might know some of the maiden names you’re so desperately seeking. And if they don’t know the maiden name themselves, they may also have various documents or memorabilia stashed away in their attic that could help you uncover clues to finding your ancestors’ maiden names. VIDEO: 6 Tips to Finding Your Ancestor’s Maiden Names – A great video about how to find your ancestors’ maiden names from the Jewish Genealogy Society of Long Island. VIDEO: Finding the Maiden Names of Women in Your Family Tree – Another great video on the subject from Ancestry.com. Five Tips for Learning Women’s Maiden Names – A short, but helpful article from Family Tree Magazine. Cyndi’s List: Female Ancestors – General Resources – A comprehensive list of resources for finding female ancestors. 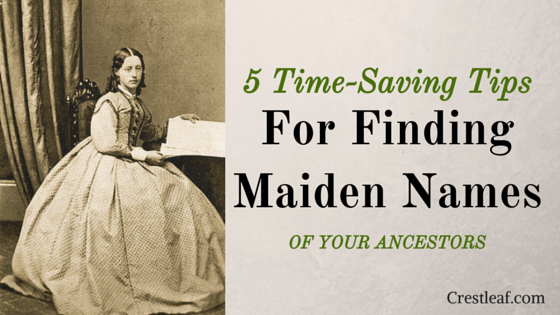 What time-saving tactics do you use to find your ancestors’ maiden names? This entry was originally posted by Crestleaf in Family Tree, Genealogy 101, Genealogy Records, Genealogy Tips, Surnamesand tagged ancestors, genealogy tips, maiden names on August 5, 2015 by Natalie L.
If you are clueless, look at next door neighbors in the census. Many times, a wife's parents are right there. How about clues in the middle names of the children? Isn't there also a HABIT of keeping the name in the family line? A lot of woman used their maiden name as a middle name for their children. When looking at marriage records, don't forget to look at the children of the couple. Not all marriage records list the parents of the bride and groom, but many do. When I have found a maiden name, that is nearly always how I've found it. Then, I can find that couples marriage record, if it exists, and find two more maiden names. Most of my research is in Iowa, and some in Ohio, where this works very well back to the 1850s at least.